Hey everyone! So a couple of weeks ago I received an awesome box of goodies from Influenster! Influenster is a site where you can review different products and potentially receive free products to sample in the form of a Voxbox. 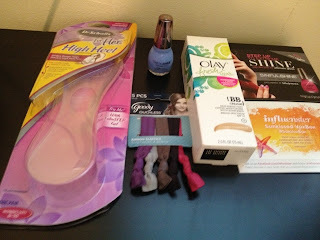 I was one of the lucky people to receive the Sunkissed Voxbox! This is the first Voxbox that I've received and I'm so excited about it! I mean, who doesn't love free stuff? Before I begin the review I want to make it absolutely clear that all opinions expressed are my own. I have not received any type of payment for this review and I was given all of the products for free. Now on to the good stuff! When I first pulled this out of the box I was super excited about it because I've been looking for BB Creams to try for a mini-series I'm doing. However, upon reading the box and seeing that the shade was light/medium I got a little disappointed. I put a drop on my hand and just knew it would be too light for me. After doing some further investigating on the product I found out that this is the darkest shade it comes in. And I saw a woman with a darker complexion than mine using it and she looked great so I decided to give it a try. Look out for a post with my full review of this product. For now, let's just say it's growing on me! Before getting this box I had heard of these elastics but I didn't understand the hype behind them. In my mind, they're just hair ties. What's so special about them? I then had someone inform me that they're awesome because your hair doesn't get tangled in them. That's definitely a plus. I've been wearing them a bit now (I don't usually wear my hair up), but not enough to form a full opinion of them. I will write a full review of them at a later time. As of right now, I really like wearing them on my wrist! This is actually the second pair that I have received for free! Right before I got a pair in this box I had received a pair from BzzAgent. These insoles are supposed to provide long-lasting comfort while wearing heels and to "shift pressure off the ball of your foot." I haven't really had a chance to try them out yet, but I will this week! This exclusive line is only available at Walgreens and comes in 32 different shades. Before this box I had heard of SinfulColors, but not SinfulShine. From what I can tell SinfulShine is a product of SinfulColors. The color I got is a pale blue called Alfresco. While I'm not a huge fan of the color, I will give it a try so I can tell you more about it. Depending on how well it works, I might be making my way to my nearest Walgreens!